The alternate title for this blog post is: See you soon, old friend. MIL and FIL returned from their trip and wanted to tell us about their travels…along with seeing their new Vitamix blender! I kept it good company while they were away by making turnip and potato soup, strawberry muffins, and spinach hummus. But I knew I had to try my hand at one more item before handing the appliance over…and that was a recipe for chocolate ice cream. The Vitamix cookbook had a recipe that looked fairly easy, and it only required me to substitute the sugar with maple syrup. There are only six ingredients needed and the time between measuring the ingredients and trying a spoonful of dessert is about five minutes. The result is what I would describe as a cross between a frozen ice and a gelato. It’s a refreshing treat that you can garnish any way you choose. So now the Vitamix blender has been delivered to MIL and FIL’s house. Although I will offer to keep it company the next time they travel so I can try some new concoctions. See you soon, old friend. Turn machine on and slowly increase speed to High. You may need to use a tamper to press the ingredients into the blades. In about 45 seconds, the sound of the motor will change and four mounds should form. I am sharing this recipe with Simply Sugar and Gluten Free…and am happy to be featured too! 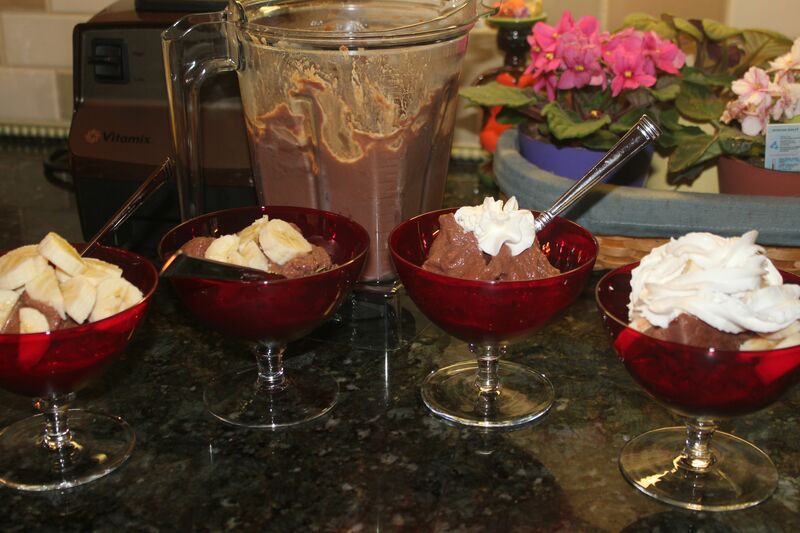 This entry was posted in Recipes - Dessert and tagged Cane sugar free, cocoa powder, dessert, Gluten free, Ice cream, vegetarian, vitamix blender. Bookmark the permalink.